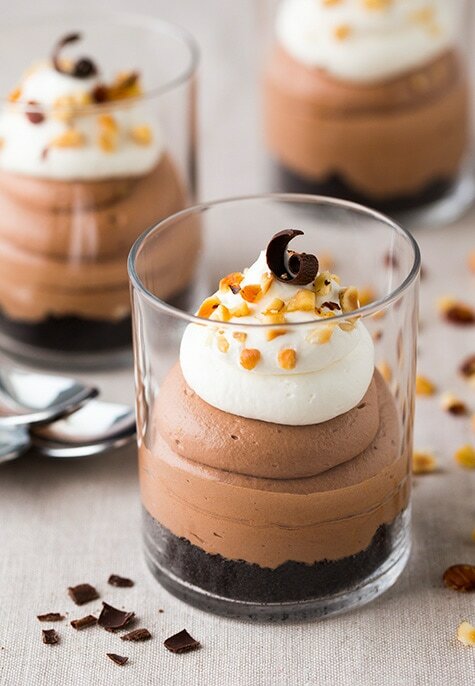 Cheesecake mousse. They contains no eggs (like many mousse recipes do) so it doesn’t require any cooking on the stove top either. 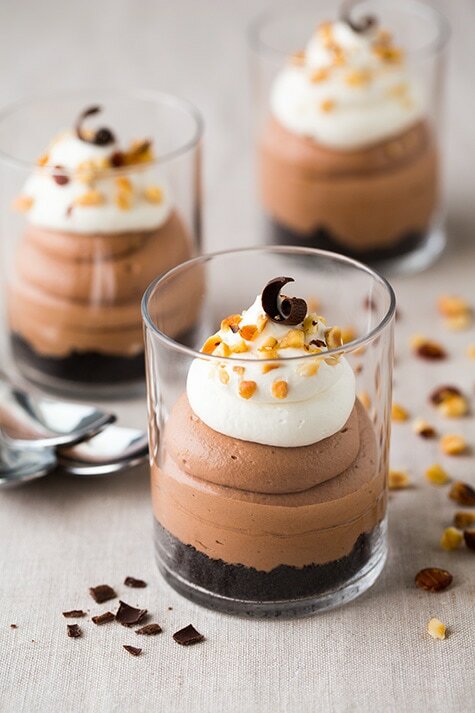 It’s just simple, irresistibly silky smooth and luscious, and amazingly fluffy mousse, at it’s finest. Then you add Nutella into the mix (literally and people what are you waiting for? These are calling your name! Simply put, these are what dreams are made of. Cheesecake and Nutella combined into one easy to make dessert that will leave you begging for more. Enjoy! In a bowl, using a fork, blend together crushed Oreo’s and melted butter until evenly coated (alternately, I just chopped the Oreos into fine crumbs in the food processor then poured the butter and and blended, scraping down sides of processor once). Divide crust mixture among 5 – 6 glass cups or dessert cups. Gently press into an even layer. Set aside in refrigerator while preparing mousse. In a mixing bowl, using an electric hand mixer, whip 1 1/3 cups heavy cream until soft peaks form. Add in 3 Tbsp granulated sugar and 1 Tbsp cocoa powder and whip until stiff peaks form. In a separate mixing bowl, using electric hand mixer, whip cream cheese and 1 Tbsp sugar until very smooth and fluffy. Add in Nutella and vanilla and whip until well blended and fluffy. Fold half of the whipped cream mixture into cream cheese mixture and fold until slightly combined, then add remaining half and fold just until no streaks remain. Transfer mixture to a large piping bag (you can also just spoon it into cups or use freezer Ziploc bags and cut corner, if you don’t have piping bags). 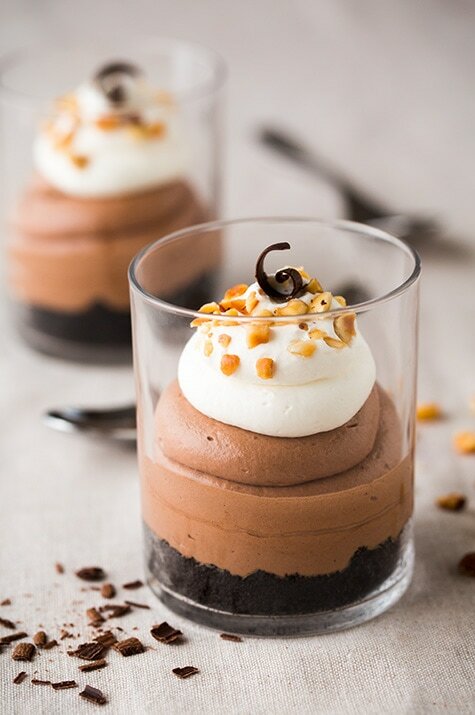 Remove cups from refrigerator and pipe mousse over crust in each cup, then transfer to refrigerator and chill 1 hour (or up to 12 hours).